I know this has been blogged on gunblogger websites (*), but not everybody follows them. And this is far too pertinent (or impertinent) to risk someone not reading the whole thing. The common refrain from gun loving people here in the United States following the terrorist attacks in Paris is that more good guys with guns on the scene would have saved lives. After all, if we can save just one life with concealed carry it will be worth it, right? There are some news reports circulating from foreign media sites which indicate that a couple people in that Paris restaurant were indeed armed and did in fact return fire, killing the terrorists and saving lives. There’s just one problem: they were reportedly drug traffickers. The only thing stopping a bad guy with a gun is another bad guy with a gun? Reading the comments section on The Truth About Guns (see the link) it's clear that gun-folks in America have a keen appreciation for the situation. Don't expect this to play real big in the Liberal Press. But ... pass it along. This is definitely Another Geek Moment! An incredible archive of rare vintage spy cameras that would rival James Bond's own collection has emerged for sale for (400,000 pounds). Among the rarities is one of only two existing examples of the Lucky Strike Spy Camera developed for the US Signal Corps between 1949 and 1950. 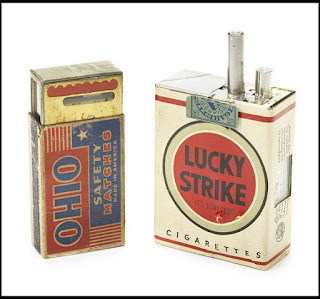 The camera, made by the Mast Development Corp, was built to fit inside the outer wrapper from a packet of Lucky Strike cigarettes. Despite its size it was capable of taking 18 x 16mm still photographs with varying shutter speeds, but ultimately it was rejected. It is worth around (43,000 pounds). Even the most clever spy-cameras are not concealable in some circumstances. I wrote last week about the Pope telling the Catholics that they must push for stronger Gun Control Measures. This week, I found an article in which the Rabbi's are telling the Jews not to have guns. Worse, Belgian Jewish Leaders want their governments NOT to issue gun permits to Jews! Using my meekest, mildest, most respectful voice, I have to say that I believe Religious Leaders of ANY faith should not interfere when their "flock" believes that they should arm for defense of themselves, their homes, their family and yes, their faith. God knows (you can tell I'm not Jewish, I can write "God" without feeling disrespectful) .... God knows that if anyone needs the means to protect, it's the Jews. They have this history of being persecuted. Oh, you already knew that? Funny. The "Belgian Jewish leaders" seem not to have noticed. I'm not sure which "Consequences" (of Jewish firearms ownership) could be more "Harrowing" than the systematic and genecidal extermination of six million jews. Apparently, the Belgian Jewish leaders expect the local police to protect the Jewish people, their institutions, and their holy places. Like THAT is going to happen! Hell, the police don't like the Jews all that much anyway, and they have a lot MORE people that they can't protect ... as their neighbors in Paris proved last week. (What's the death toll there now? 130+ dead, hundreds wounded?). This is why I don't go to church any more. I just don't like being told what to do by a bunch of idiots. I didn't like it when I was in the army, which is why I got out of THAT fiasco as fast as I could. Unfortunately, our National Leaders consisting of Obama, Kerry and Clinton, odds are I'm still not going to avoid being told what to do by Idiots. Fortunately, I can ignore them. Michelle Obama once famously said: "For the first time, I am proud of my country." I say: "For the first time, I am ashamed of my country, that would select such a Harlot as John Kerry for a leader."